Your comfort is our highest priority! Since 1992, Drs. 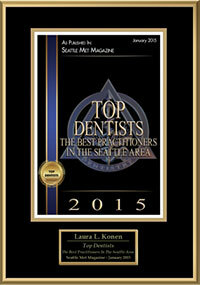 Dominic Lee and Laura Konen have provided quality dental services in a warm and friendly atmosphere. You can rest at ease knowing that our doctors and staff will always go the extra mile to make sure you have optimal dental health care. For your comfort, we have blankets available during your visit as well as magazines, tea and coffee in the reception area. But what sets us apart from the other dental offices in our area is our staff! We have an outgoing and personable team who cannot help but to make you smile! Come see for yourself what a wonderful place the dental office can be! Contact Greenlake Family Dentistry to schedule an appointment. We offer convenient hours that fit your family’s busy schedule. Give us a call today! Dr. Laura Konen and Dr. Dominic Lee are your Family Dentists offering comprehensive care for children, adults and seniors in the Puget Sound.